If you live anywhere in the Gulf or on the Atlantic coast you’re probably well aware that tropical storms are likely, especially now that we’ve entered hurricane season which runs from June 1st to November 30th. However, it is important to be aware of the extent of the risk to yourself and your property and how you can prepare to minimise that risk and the associated costs of potential damages. Also, it’s important to note that it’s not only coastal areas that are at risk. Hurricane Harvey was close to a category 4 hurricane when it hit land at Port Aransas, Texas, yet had died down to a level one by the time it got inland to Houston. Despite the diminished power, the resulting rains broke records and lead to the deaths of 60 people. Insurance is the obvious first step toward protecting your home and we look at the national averages per state, as well as what it could cost you to repair damages should you choose not to insure. 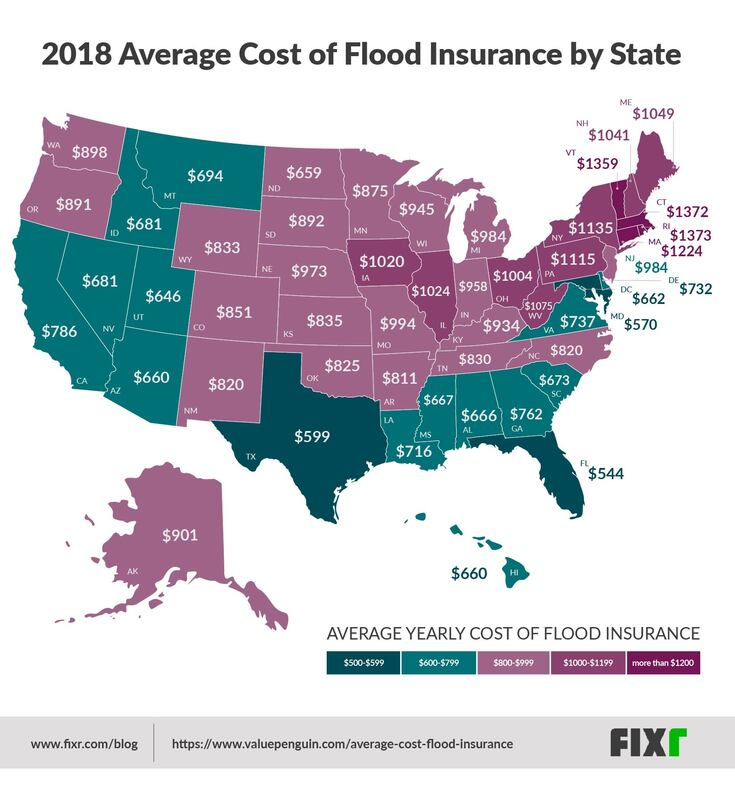 The flood insurance rates shown in the image above are taken from ValuePenguin’s latest report on flood zones based on the NFIP’s annual premium breakdown. Premiums vary from $500 to $1,200 annually, and amounts indicated are state averages, so variances can occur depending on your exact location. 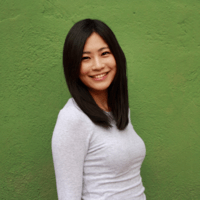 Price ranges are indicated using color, starting with a dark teal for premiums of $500-599 and getting lighter then fading to deep grape for premiums of more than $1,200 per year. Interestingly, Texas and Florida fall into the low-cost bracket with an average of $500-$599 indicated. This may be because both coastlines are considered most at risk for hurricanes, so they benefit from government subsidies. It may also seem strange that the central states like Arkansas and Missouri fall into the mid-to-high level premium range. However, due to areas of low lying land leading to mountainous ‘barriers’, these states are at risk from secondary effects of hurricanes, like unusually high rainfall patterns, which lead to flooding. Due to the range of premium prices, The Federal Emergency Management Agency (FEMA) provides a map that will identify what risk your home falls under. Your insurance broker can then proved a quote specific to your location. The map is updated every 5 years as patterns change, so it’s worth keeping track of changes and adjusting your insurance as necessary. Comprehensive cover is especially necessary for high-risk areas so it is worth re-assessing your policy now, to ensure you are adequately covered should disaster strike. Most insurers will not add cover once the storms have already started. It is also important to note that most insurance companies only include water damage in their standard household policy offers. Separate flood cover is necessary which may be offered through your insurer by the National Flood Insurance Program (NFIP). According to FEMA’s regulations, if you fall into a high-risk zone, lenders will be required to ensure you have flood insurance before approving a mortgage application, though this insurance is a good idea for everyone in these areas. An indication of the potential costs involved to repair flood damage for a 2000 sq.ft. home is given in the image above. Should you choose not to get flood damage insurance at all, or you are not adequately insured, you could be looking at some steep bills for repairs. In fact, homeowners without insurance had to cough up between $18 and $27 Billion for repairs as a result of hurricane Harvey in 2017, however, insured homeowners only suffered losses to the value of $0.5 Billion. The prices in the graphic indicate our current national Fixr.com averages for home repairs. We compile these figures using unbiased industry and government studies and costings, including government and industry journals, published cost studies and state and private association’s websites. This ensures the figures are accurate and fair and they’ll give you a realistic idea of how much repairs will cost. Given that costs can vary we have indicated a total that would be necessary should you need to carry out all of the listed repairs. Of the $21-26,000 total bill, 30% will be spent on cleaning alone and that includes cleaning of clean or grey water. The actual repairs could cost between $13,500 and $18,500, which includes repairing and replacing hardwood floors (900 sq.ft.) and carpeting (in 3 rooms or 600 sq.ft. ), structural damage repairs (in 3 rooms or 600 sq.ft. ), mold cleaning and prevention (1 to 3 rooms) and general household wood or brickwork (window trims, baseboards, doors in a 2,000 sq.ft. house or 1-2 days of work from a carpenter), and it depends on materials and finishes used. Even if you don’t need to carry out all of the above repairs, should your home be hit by a flood, you will most likely be left out of pocket. Following the flood, you’ll probably be anxious to return home and evaluate the state of your home. It could even be possible to salvage some items, though the sooner you have access, the more likely you are to succeed, as mold can develop within 48 hours. Be sure to wear protective clothing both for hygiene and safety purposes. At the end of the day, it's your choice whether or not to get insurance, but we would argue, just like putting up sandbags and covering your windows with storm shutters, prevention is better than cure. Should a storm hit, with comprehensive insurance in place, you can focus on the immediate task of making sure everyone gets to safety as quickly as possible with a full plan for either taking cover or evacuation. Once the storm passes you’ll be able to begin repairs straight away and return to normal life, rather than stressing about bank balances and settling debts.